It’s 5AM and I’ve been awake for about an hour now. After 30 minutes of tossing and turning in bed, I had a bit of a panic attack when I remembered that my uniform for work was in the laundry. I jumped out of bed and found myself sorting laundry in the closet as to not wake my fiancé. I guess that is a bit of news I’d hadn’t shared here. My boyfriend proposed to me at dinner a few weeks ago. It was our 16 month anniversary and we were eating at Houlihan’s in Leawood. It was where we had gone on our very first date. We had planned to go to dinner early because the Kansas City Royals were playing game five of the World Series at 7PM. We were standing outside the restaurant talking about our first date and how we stood outside the restaurant talking after a long dinner. I turned around to walk in and Jeremiah spun me back around before getting down on one knee. I was a little in shock. If I was, you should have heard all the people around us. The people dining on the patio and getting in/out of vehicles were like “Is he prosing?” “Did she say yes?” Of course, without a doubt in my mind, I said yes. We went into the restaurant and the server asked us how it was going. I said, “We just got engaged.” He was like, “Congratulations!” I was like, “It was a minute ago just outside the restaurant. This is where we went on our first date.” The table next to us asked if he could take our photo when he overheard us. He told us how it was he and his wife’s second marriage but when you find the right one, it’s meant to be. The restaurant was so sweet and the manager brought us champagne and dessert to celebrate. Phone calls were made while we waited for our lovely dinner – the George Banks Sea Scallops with risotto and fresh arugula (one of my absolute favorite dishes of all time). As you all know by now, the Royals won it in game five beating the Mets in extra innings. It was also my mother’s birthday so this is certainly a day we will never forget. Unfortunately, I haven’t been sleeping very long since our engagement. I wake up with ideas about our vows or what food should we make during our engagement photos. The date is set for July 2016 so I need to get cracking on these details. The venue is pretty much set, the guest list has been made, our wedding app/website has been created, half the attendants have been asked (including our adorable 3 ½ month old ring bearer), and the photographer has been selected. However, I have no idea what my dress will look like or what colors I want. I also need to email my hairdresser to see if she’s available. Every hinges on what time my hair can be done. Oh let’s hope she’s available because I have zero skill when it comes to doing my hair. I better email her right now, this is really important. So since I’m awake and my laundry is in the wash, I decided to write a blog post for all of you. It is Thanksgiving week. Can you believe it? Normally, I would have already scoped all the Black Friday ads and had a plan for our day after Thanksgiving adventure. This year, I’m worried about whether or not I need to schedule a dress outing the Saturday after Thanksgiving with my mother and sister. I’m also not sure what on earth to get my fiancé for Christmas in our $75 spending limit? In honor of it being Thanksgiving week though, I have decided to share with all of you one of the recipes Jeremiah and I will be making for my family. This is a recipe we learned last year while taking a cooking class at the Culinary Center of Kansas City. 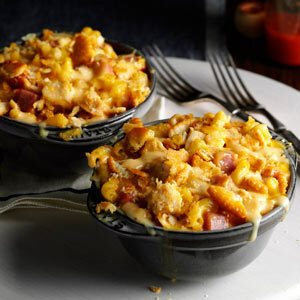 Not to worry my vegetarian friends, I’m including modifications for you to enjoy this recipe as well. I made both recipes for our Thanksgiving work potluck last week. Cook sausage until browned. Add onion, apple, and celery. Sauté for 3 minutes. Stir in seasonings. In a large bowl, combine sausage mixture, bread, and broth. Spoon the stuffing into a sprayed 11 x 7 baking dish. Bake at 350 degrees covered for 15 minutes. Uncover and bake an additional 20 minutes. Nutrition: Makes nine (1 c.) servings. 208 calories, 5 g. fat, 11.9 g. protein, 28.9 g. carbs, 2.1 g. fiber. Rachel said to not use green apples for this recipe. They are not sweet/juicy enough to sauté. Did you know you can eat the leafy part of celery? It’s actually really flavorful. I brought two loaves of fresh French bread at Spouts. I cubed 1 ½ loaves and let it sit out in a bowl overnight. I used the extra bread for a brioche French Toast. I used the local brand of ground sausage. It added some extra flavor. I’ve found the lowest sodium chicken broth is Rachael Ray’s brand. To make it vegetarian friendly, I substituted veggie broth and removed the sausage. In its place, I put some dried cranberries. After my luncheon, Jeremiah and I mixed the leftovers. It was good so feel free to add cranberries to the original recipe. For a little crisper stuffing, bake covered 15 minutes and uncovered for 35-40 minutes. Fried chicken is one of my favorite food items. And let’s be honest, who doesn’t crave a little KFC now and then. Unfortunately, traditional fried chicken isn’t super healthy. 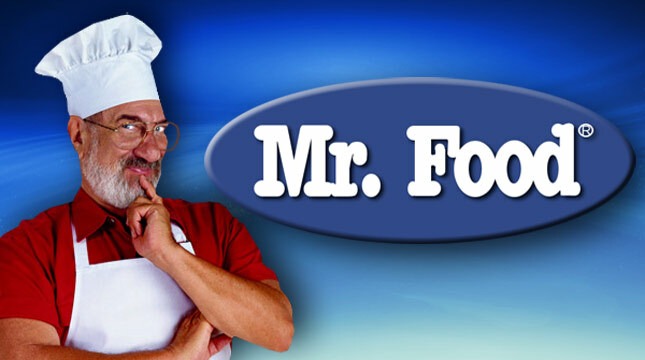 I ran across this Mr. Food’s recipe for a baked chicken that promised a fried chicken crunch. I have to say, this chicken did have a nice crunch as well as nice and juicy. You have to try this diabetic friendly “fried” chicken. Preheat oven to 350 degrees. Mix flour, salt, and pepper in a shallow dish. Beat egg whites in a second shallow dish. Crush cornflakes and sage in a plastic bag. Then, pour into a shallow dish. Take each piece of chicken and flour it. Then, coat it in egg. Finally, coat in cornflakes. In a sprayed dish, place each piece of chicken. Bake for 45-50 minutes. Nutrition Facts: (2 pieces per serving) 299 calories (64 calories from fat), 7 g. fat, 2 g. saturated fat, 84 mg. cholesterol, 627 mg. sodium, 25 g. carbs, 1 g. fiber, 3 g. sugar, and 32 g. protein. I cut the recipe in third. I only ate one piece with potatoes and felt satisfied. I used boneless, skinless chicken breasts. I also used egg white substitute. Recently, I met Bobby Deen at an event featuring his new cookbook. I was surprised to learn during a conversation with him that unsweetened cornflakes aren’t any worst for you then Panko bread crumbs. Since I like the taste better, I wouldn’t worry about using them in recipes. Bobby did still suggest using Panko bread crumbs on veggies though. A couple of years ago, I won a free two night stay at the Marriott City Center Denver at my company holiday party. My sister and I took advantage of it with a long weekend trip the following November. We even met up with an old friend from a junior high camp and a college roommate. Steph and I had a blast visiting a candy factory, educating ourselves at The Denver Art Museum, shopping at a holiday mart at the Denver Botanic Gardens, attending a film festival, and sipping on libations at a wine festival. Plus, we met some of the friendliest people using the public transportation. Although I can’t remember the name of the restaurant, I had one of the most amazing sandwiches of my life there. It was a turkey sandwich with a rosemary au jus (turkey version of French dip). It’s probably when I feel in love with the seasoning rosemary. I’ve searched the internet and haven’t been exactly able to recreate that dip but this recipe is pretty good. I’m going to give it to you with the turkey recipe but you can always just mix the ingredients with the dripping from however you cook your turkey this Thanksgiving on your stovetop. Add flour to bag, close, and shake. Place bag in 13 x 9 baking dish. Add broth, sage, rosemary, and thyme. Add rinsed and paprika topped turkey to bag. Close bag with tie. Cut six (1/2 inch) slots into the top of the bag. Roast the turkey at 350 degrees for two hours, until meat is done. Let is stand for at least 10 minutes before slicing. 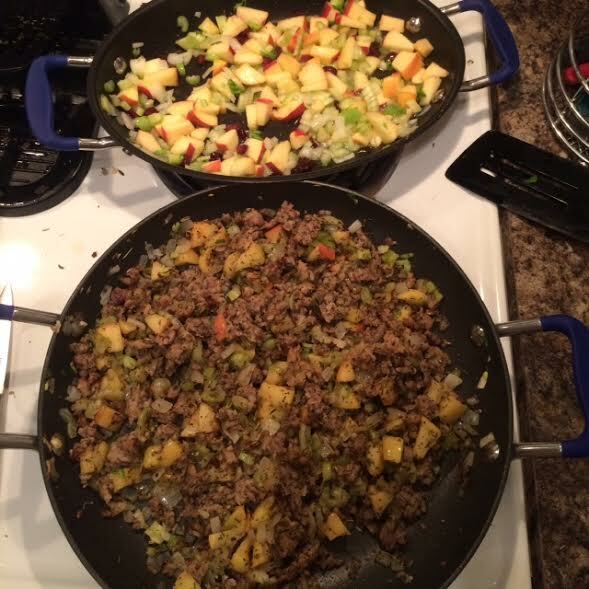 Take leftover juices and mix with on can of gravy on the stovetop. *Two websites list different sources.